Home / Cancer Information / Learn to cope / What is cancer? Cancer is a disease of the cells. Cells are the body’s basic building blocks – they make up tissues and organs. The body constantly makes new cells to help us grow, replace worn-out tissue and heal injuries. Normally, cells multiply and die in an orderly way, so that each new cell replaces the lost one. Sometimes, however, cells become abnormal and keep growing. In solid cancers, such as bowel or breast cancer, the abnormal cells form a mass or lump called a tumour. In some cancers, such as leukaemia, the abnormal cells build up in the blood. Not all tumours are cancer. Benign tumours tend to grow slowly and usually don’t move into other parts of the body or turn into cancer. Cancerous tumours, also known as malignant tumours, have the potential to spread. They may invade nearby tissue, destroying normal cells. The cancer cells can break away and travel through the bloodstream or lymph vessels to other parts of the body. The cancer that first develops is called the primary cancer. It is considered localised cancer if it has not spread to other parts of the body. 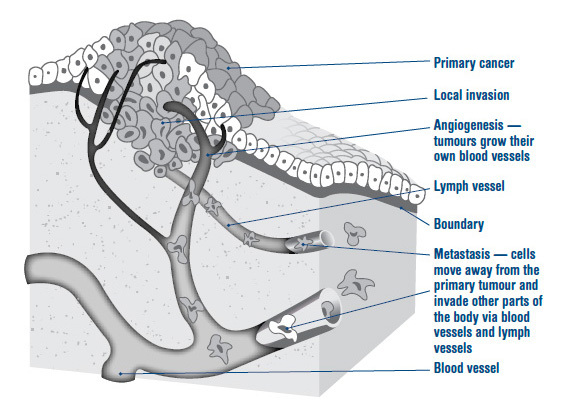 If the primary cancer cells grow and form another tumour at a new site, it is called a secondary cancer or metastasis. A metastasis keeps the same name as the original cancer. For example, bowel cancer that has spread to the liver is called metastatic bowel cancer, even though the main symptoms may be coming from the liver. Each cancer is very different in how it is diagnosed and treated. This specific information can be found in our cancer types section. For more information about cancer call Cancer Council 13 11 20. The information available on this page should not be used as a substitute for advice from a properly qualified medical professional who can advise you about your own individual medical needs. It is not intended to constitute medical advice and is provided for general information purposes only. See our disclaimer.